ACT 1 SCENE 1 The stage is dark and the curtain opens and we find the stage divided into two horizontal planes. The upper quarter of the set reveals a graveyard scene, seen from the bottom three-quarters of the stage where most of the action takes place. Two enormous trees show their trunks in the upper quarter and make an interesting set motif with the dangling root system as a design for the lower three-quarter of a set. The under grotto will be basically dark and appear to be a subterranean hollow; the depth feeling being created by the perspective placing of the root-system design. The upper-quarter graveyard scene and the legs of the funeral company will show. Slowly as the play lines direct, a casket will be lowered on long white ropes, until the deceased is apart of the lower company, already assembled awaiting his arrival. As the play progresses, a council of twelve people slowly set-up a tribunal arrangement of people, chairs, and tables. Two of the on-lookers are upstage and are busily engaged in the first conversations of the play. ***Other than Mr. X. 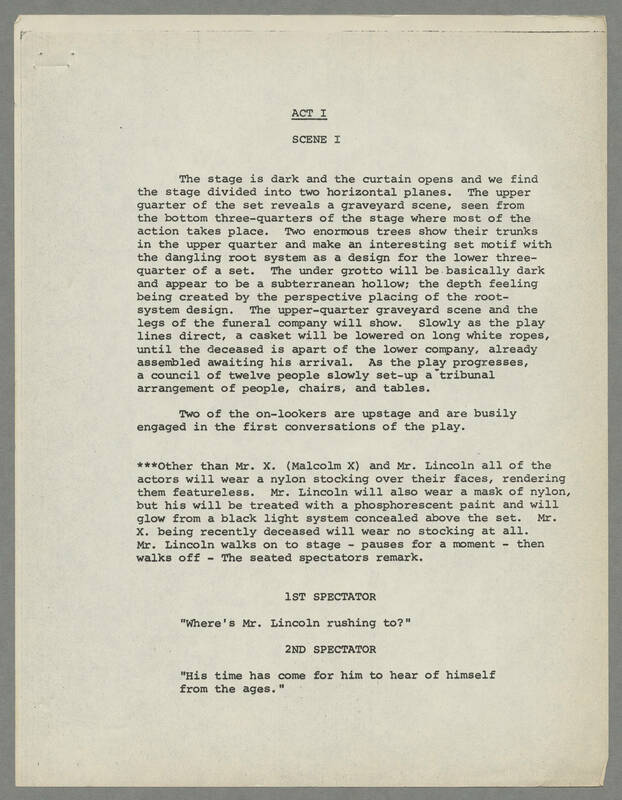 (Malcolm X) and Mr. Lincoln all of the actors will wear a nylon stocking over their faces, rendering them featureless. Mr. Lincoln will also wear a mask of nylon, but his will be treated with a phosphorescent paint and will glow from a black light system concealed above the set. Mr. X. being recently deceased will wear no stocking at all. Mr. Lincoln walks on to stage - pauses for a moment - then walks off - The seated spectators remark. 1ST SPECTATOR "Where's Mr. Lincoln rushing to?" 2ND SPECTATOR "His time has come for him to hear of himself from the ages."